The praying mantid normally lives in flowery, damp, warm, tropical environments. Rain forests, gardens, and even dung in the middle of Africa houses these amazing insects. Biotic factors of praying mantids lives include the plants that they live among, the insects and arachnids that they eat (including each other), the birds and other small animals that eat them, and the people that can help or hurt their environments. There are a few abiotic factors that affect the lives of praying mantids, too. A few of these factors are the climate (temperature, humidity, etc. ), the types of soils, and the amount of nonliving things that they have to camoflauge into. The praying mantid has become more or less resistant to its predators by adapting color patterns to help blend into its environment extremely well. The mantids have also helped the plants they live on to resist the harmful insects that feed on the greenery. Praying mantids help control pests in our world without the harmful effects of chemicals. With an over population of praying mantid, the mosquitos would all die, which could affect moose and other mammel populations in less inhabited parts of Canada. 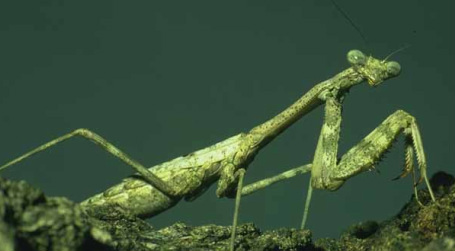 The praying mantid may pinch but will not bite if held and the mantids are very closely related to termites.